Verifone (NYSE:PAY) , announced today that several hundred buses in Poland’s major cities are now providing passengers self-service ticketing using Verifone’s UX Series of unattended contactless payment devices that can display payment amounts and targeted messaging to consumers. 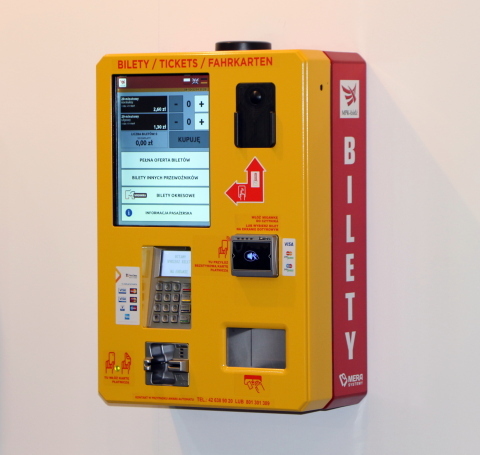 “Cashless ticket vending machines are useful and modern tools dedicated to purchasing tickets, recharging urban cards and cell phones in public transportation, and are gaining more and more popularity among passengers. 24-hour access to devices, secured payment processing and time savings are the main advantages of buying tickets using mobile vending machines,” said Grzegorz Lange, CEO for Mera Systemy. “Wincor Nixdorf’s payment software is integrated with Verifone’s modular UX series. Effective cooperation between partners involved in the project contributed to the growth of card payments in the public transportation sector and – consequently – to improving travel speed and convenience for passengers,” said Grzegorz Slomi’nski, Cashless Payment Solutions Director at Wincor Nixdorf Sp. z o. o. This press release includes certain forward-looking statements within the meaning of the Private Securities Litigation Reform Act of 1995. These statements are based on management’s current expectations or beliefs and on currently available competitive, financial and economic data and are subject to uncertainty and changes in circumstances. Actual results may vary materially from those expressed or implied by the forward-looking statements herein due to changes in economic, business, competitive, technological and/or regulatory factors, and other risks and uncertainties affecting the operation of the business of VeriFone Systems, Inc., including many factors beyond our control. These risks and uncertainties include, but are not limited to, those associated with: successful rollout of our unattended solutions in Poland, execution of our strategic plan and business initiatives and whether the expected benefits of our plan and initiatives are achieved, short product cycles and rapidly changing technologies, our ability to maintain competitive leadership position with respect to our payment solution offerings, our assumptions, judgments and estimates regarding the impact on our business of the continued uncertainty in the global economic environment and financial markets, our ability to successfully integrate acquired businesses into our business and operations, our ability to protect against fraud, the status of our relationship with and condition of third parties such as our contract manufacturers, distributors and key suppliers upon whom we rely in the conduct of our business, our dependence on a limited number of customers, the conduct of our business and operations internationally, our ability to effectively hedge our exposure to foreign currency exchange rate fluctuations, and our dependence on a limited number of key employees. For a further list and description of the risks and uncertainties affecting the operations of our business, see our filings with the Securities and Exchange Commission, including our annual report on Form 10-K and our quarterly reports on Form 10-Q. The forward-looking statements speak only as of the date such statements are made. Verifone is under no obligation to, and expressly disclaims any obligation to, update or alter its forward-looking statements, whether as a result of new information, future events, changes in assumptions or otherwise. Mera-Systemy specializes in designing and production of modern, automatic fare collection systems for products and services in public transport, including ticket vending machines in vehicles and public locations (more than 3,000 devices delivered). We provide complete solutions for automatic distribution of tickets along with smart tools to manage sales network. Wincor Nixdorf is one of the world’s leading providers of IT solutions and services to retail banks and the retail industry. The main focus of the Group’s comprehensive portfolio lies on business process optimization, especially in the branch operations of both sectors. We also apply the expertise we have gained from our core business to related industries such as postal services and service station networks. We supply IT services across the world. Our well-established Services organization works with a network of certified partners to guarantee the same high quality at a global level. Wincor Nixdorf has established a presence in around 130 countries around the globe, giving it an outstanding profile when it comes to customer proximity. The parent company has subsidiaries in 42 countries. We also place great importance on building close relationships with sales partners that have an excellent knowledge of the local requirements and conditions on the customer side. Wincor Nixdorf has a total workforce of around 9,000 people. Over half are based outside Germany. Verifone is transforming everyday transactions into opportunities for connected commerce. We’re connecting more than 26 million payment devices to the cloud – merging the online and in-store shopping experience and creating the next generation of digital engagement between merchants and consumers. We are built on a 30-year history of uncompromised security. Our people are known as trusted experts that work with our clients and partners, helping to solve their most complex payments challenges. We have clients and partners in more than 150 countries, including the world’s best-known retail brands, financial institutions and payment providers.